Puracol Plus AG Collagen Dressing with Silver by MedLine promotes natural healing with type 1 100% native collagen and antimicrobial properties found in ionic silver. MedLine's unique manufacturing technology preserves the structure of the collagen and provides more collagen to a wound for a longer period of time. The ionic silver provides a non-staining barrier for the wound. Chronic wounds have a high levels of matrix metalloproteinases (MMPs), this causes necrotic tissue to break down and lowers the amount of collagen produced for healing. 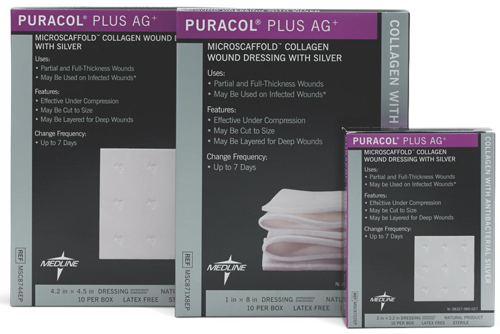 Puracol Collagen Dressing provides the collagen lost due to MMP activity and promotes a faster healing cycle. 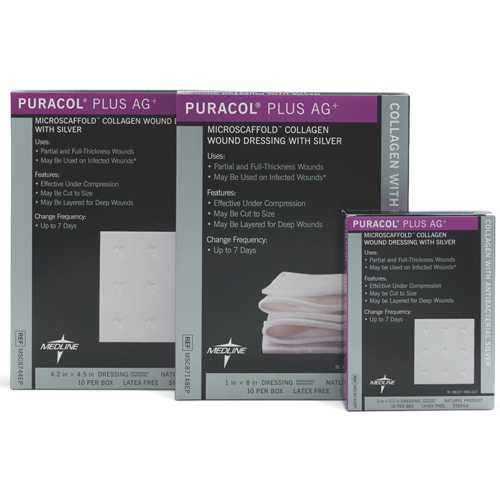 Other available wound dressings similar to Puracol Plus AG include DermaCol AG Silver Collagen Matrix Dressing and BioPad Wound Dressing with Collagen. Puracol Plus AG from Medline on Vimeo. Puracol Plus Rope from Medline on Vimeo.